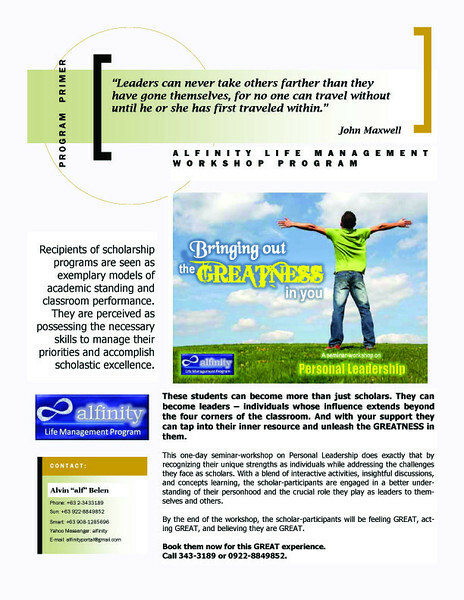 Since students who are scholarship recipients are usually seen as dynamic, innovative and with much potential for leadership, my good friend Alvin M. Belen decided to offer a leadership workshop for them this summer. Give these kids yet another reason to avoid going to a cigar bar or ending up drunk in some beach with their peers this summer. Call 343-3189 or 0922-8849852 or e-mail alfinityportal@gmail.com for more details. Mr. Belen is currently a freelance speaker and consultant. 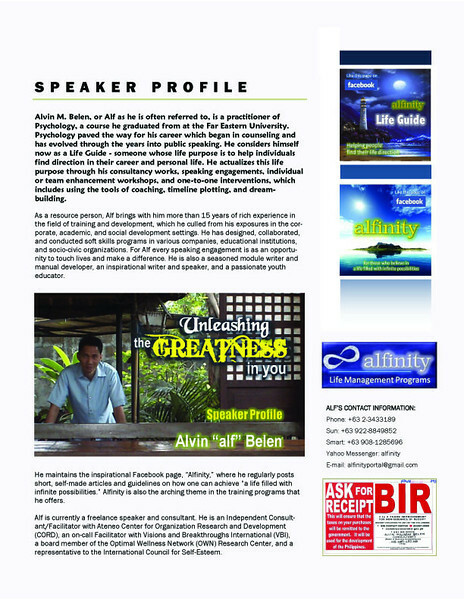 He is an Independent Consult-ant/Facilitator with Ateneo Center for Organization Research and Development (CORD), an on-call Facilitator with Visions and Breakthroughs International (VBI), a board member of the Optimal Wellness Network (OWN) Research Center, and a representative to the International Council for Self-Esteem. Feel free to forward to organizations you may know who are helping scholars and thinking of how better to invest in these kids.